It goes without saying, that no matter who promises what when it comes to our information, we need to be very careful about what we do with it anyway. College or University graduated from and what city. High School graduated from, what city, and what year. Social Insurance Number (SIN - Canada), Social Security Number (US). Major purchases made and where. This type of information may seem to be inert on its own, but new services such as pipl are proving that data mining capabilities are becoming more and more sophisticated. Keep this in mind when it comes to publishing personal information anywhere including social and business networking sites. So, when it comes to our credit cards, we are quite diligent in our monitoring of the transactions on each card by checking our online statements at least two to three times a week. In our case, at least one of our credit cards have been impacted by this security breach. And, when it comes to protecting our identity, we subscribe to one of the big three's credit profile monitoring services that sends out a weekly e-mail indicating whether anything has changed on our credit profiles. If the e-mail indicates a change, and we did not initiate that change, then it is imperative to jump on investigating what was up immediately. The e-mail gives an indicator, but we can log onto the report's site and take a closer look at the details. Heartland Payment Systems has a Web site dedicated to the breach of their systems: Heartland Payment Systems Breach 2008 site: 2008Breach.com. The front page of the site has a statement by the Chairman and CEO of Heartland Payment Systems. "... we will not rest until we have the answers to how and why this breach occurred so we can prevent any future attacks at Heartland and elsewhere." They do not know "how" the breach happened?!? The "why" is irrelevant. How about telling us the "when"? Was Heartland the victim of a data breach? Yes. During the week of January 12, we learned we were the victim of a security breach within our processing system during 2008. Now give that answer a once over again: "...DURING 2008"!!! While a forensic investigation may be on the go now, if the breach was an ongoing thing that has just been discovered, will the investigators ever be able to pinpoint whether the breach originated in 2008, or 2007, or even 2006 and beyond?!? How did we learn about the breach? After being alerted by Visa® and MasterCard® of suspicious activity surrounding processed card transactions, Heartland enlisted the help of several forensic auditors to conduct a thorough investigation into the matter. Last week, malicious software was discovered that potentially enabled data to be compromised as it crossed Heartland's network. The magnitude of the breach and its implications are staggering in this case. It took a group of third parties to let the company know that there was a problem with its systems. So, we have an indication of a breach, we have a Web site with some information on it, but that is about it?!? Not only that, Heartland chose to release the news on the day of President Obama's inauguration! One need not venture into the motivation behind this, but the implications are there ... where is the company's transparency? It leaves us with an affirmation that our skepticism of the "system", and personal data protection, expressed in the first couple of paragraphs in this blog post are well founded. We have seen a number of high profile security breaches in our headlines over the last couple of years or so. As a result, it is up to us to keep up that healthy skepticism and make sure we cover as many of the bases as possible when it comes to protecting our identity and financial information. Only use one credit card for online transactions. If possible, have an ultra low limit on that credit card. Obtain the card from an institution that practices call-backs for out of the norm transactions. Obtain the card from an institution that allows for card number rotations on an annual or bi-annual basis to further protect the card. Where possible, utilize a trusted third party payment system such as PayPal for online transactions to keep credit card information out of the merchant's hands. Monitor the transaction log for bank accounts, credit cards, and credit profiles (Canadian Trans Union Credit Monitoring). And finally, when are our legislators going to get some laws in place making it mandatory for all companies to report a breach that would impact our identities, livelihood, and personal data? It is high profile cases, such as the Heartland Payment Systems breach, that beg the question about breaches with companies that process personal information and never report it. Lawyers and mitigating risk to a company should never trump a person's right to know their data has been compromised ... ever. "One hundred Million Transactions PER MONTH"
The depth of this breach is just mind boggling. We just finished a successful integration of the Lacerte 2006 software on an SBS 2008 domain with 100% Windows Vista workstations. No spaces allowed in any of the folder names! Keep the file location simple as above. The Setup.exe file needs to be run from a workstation. Again, note the lack of spaces in the folder names. Windows Vista uses a folder called ProgramData so we copied the name for all server installed applications. Lacerte will warn about running it on Windows Vista as shown above, click the Continue button. Once the install finishes, the workstation install will need to run. 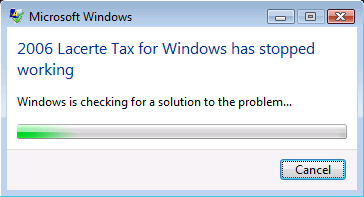 Leave the default C:\Lacerte\06Tax folder to install to. Allow it to run the updates notifier. Allow it to install the MSDE that it needs locally. The Vista Warning will pop up again, this time check the Don't show this again option. A reboot of the workstation will be required. Run the program. If it warns you again, make sure to check the Don't show this again option and it should no longer bother you. It may stall a few times on various set up routines. Just be patient. The program will begin to respond. Note that the firm's Federal ID Number will be required once the program fires up. Rename the new IDATA folder to IDATA-Original. Copy the firms existing data folders into the 06Tax folder. Restart Lacerte 2006 and the firm's data should be there. NOTE: Do not copy the firm's data into the 06Tax folder until such time as Lacerte 2006 has had a successful start up after the first workstation install. While we have not run through our testing of the Lacerte 2005 program, if it shares the same code base as Lacerte 2006 then it should install and run okay. One thing to keep in mind in this particular case is that we already have a number of applications installed on the Windows Vista workstations that utilize similar components to Lacerte. So, we did not encounter any problems with the Windows Firewall with Advanced Security. 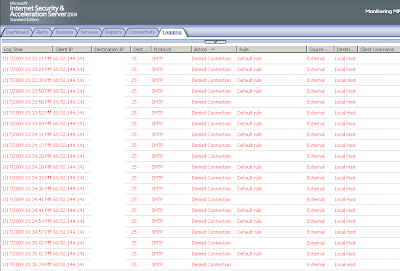 If a connection cannot be completed, make sure to Unblock any service request warnings by the firewall. 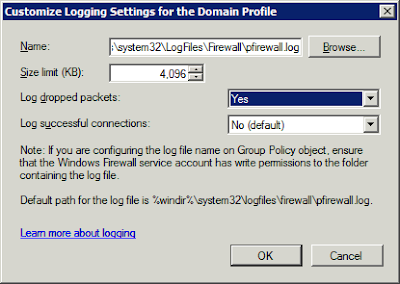 Enable the logs on the server and workstation to check for dropped packets and any rules that may need to be created. Port 1433 probably would show up due to the SQL MSDE instance on the workstations. They may experience an application hang when shutting down the program. They need only wait until the Cancel button changes to Close program and click on that. This is, unfortunately, one catch for running older applications on a newer OS. One of the more annoying puzzles that needed to be figured out was how to get an RDP session via the Remote Web Workplace to work full screen with monitors connected to the same system that are a different size. Why was it annoying? Because, with the advent of RWW on SBS 2008 where there is no ability to control the connected desktop's resolution anymore, so we end up with scroll bars and a partial view of the connected desktop if it comes up on the smaller screen. The RDP session will always come up on the monitor that the IE browser window was in. Set the smaller monitor as the Main Monitor. Do not close the Display Settings window. Move the IE browser window to the smaller monitor. Connect to the remote desktop using the Connect to ... Computer link. 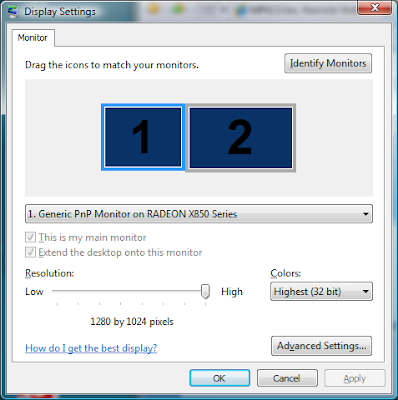 Once the logon has completed and the remote computer's desktop has come up, switch the Main Monitor back to the larger of the pair. When we are working on a workstation with an odd set of monitors like this, we tend to put the client's server or desktop on the larger monitor, and have our reference desktop VM opened up on the smaller monitor in full screen mode. This method works for both SBS 2003 and SBS 2008 Remote Web Workplace desktop sessions. We ran into a strange struggle while troubleshooting a client's line of business application today. SBS 2008 is the primary server with all client computers running Windows Vista Business Service Pack 1. We have set up a limited domain user account that was pushed out to all of the client computers and subsequently added to the local admin group on them for software installs and system configuration changes. The password on this account has not been rotated yet as this is a relatively fresh install. It will be rotated on a regular basis once things have settled in. 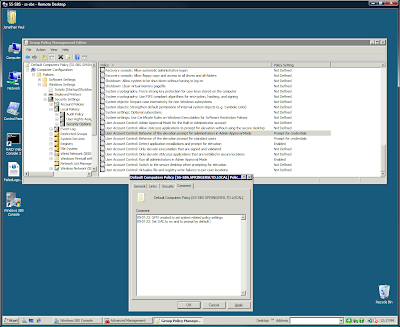 Remote Assistance in SBS 2008 allows the user to check a box to transfer UAC prompts to the one providing the remote assistance. But, they first need to affirm that setting by receiving a UAC prompt. When we were providing remote assistance for the LoB and the user enabled the setting to transfer UAC prompts to us, no UAC happened. We knew this because the RA window goes black during that initial UAC prompt. It did not take long to see that the user had managed to disable the Windows Vista UAC prompt altogether. Note that we set a comment into the properties of the GPO itself to keep track of the GPO's creation date, the changes we made and when they were made. We do this for all GPOs, but in this particular case the Windows Settings node does not allow for comments on each setting, so it is particularly important to make note of any changes we have made. 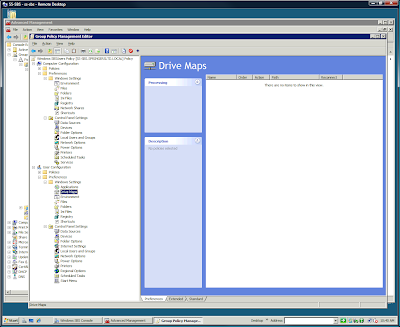 The Administrative Templates nodes for both User Configuration and Computer Configuration allow for us to comment on the individual settings. We also comment when we have made changes to any settings in those nodes too. Once the new settings have been updated on the client workstations, the UAC will not be able to be disabled. UAC is, in our experience, one of the best ways that a user can use to prevent any malware or virus infections. Once a user is aware of the implications when they see a UAC prompt, and they know they need to cancel, unless they initiated a software install, it is virtually impossible for any bad software to take hold of the system. We did the opposite of Petri's Method #3 to disable UAC in Group Policy: How can I disable the User Account Control (UAC) feature on my Windows Vista computer? With the exception of any Windows Vista SP1 workstations that have the RSAT (download site) installed, all workstations and servers will need to be updated to accept the GP Preference settings pushed out to them. For those using WSUS, the update should have come and gone a while back: Microsoft Knowledgebase KB943729: Information about new Group Policy preferences in Windows Server 2008. If not using WSUS, then a file for each OS and architecture (x86 or x64) will need to be applied. The above search results link contains links to each file needed as does the KB article. Group Policy Preferences are just that: Preferences. They enable us to provide the user with a set of allowed configurations on their desktops that they can choose. If they don't like something in one of the GP Preferences, they can disable it, change the setting to something they prefer, or just ignore it altogether. They also give us the ability to fine tune a user's experience as well as connected network resources without the use of complicated logon scripts. We can create and link a GPO to an OU or Security Group to limit the scope of the preferences. Or, we can use GP Preferences to set up and push a local admin account (using a limited domain account created in ADUC) on all Windows Vista and XP Pro workstations that we can change the password for in a snap after say a run of software updates. Thus, once the password has been changed, it is possible to have a little more control over what is happening on the SBS network. This feature is one big plus to migrating existing SBS 2003 domains to SBS 2008. It never hurts to have a quick reference to the more complicated aspects of the products we work with. Group Policy Settings Reference for Windows Server 2008 and Windows Vista SP1. The download is in either Excel 97-2003 format or the new Excel 2007 format. Note the difference in the size between the old and new formats! The benefit of having the spreadsheet is the ability to do a quick Find to search for a policy setting. Each setting has its location with the GPO indicated, its name, what client and server OS versions support it, a really good explanation of the setting, and whether a reboot or logoff would be required to get the policy setting to apply. Group Policy is a pretty awesome thing for us to manage our SBS domains. The new Windows Server 2008 Group Policy structures we inherit with our SBS 2008 domains are phenomenal. One example is Group Policy Preferences. They give us such granular control over so many aspects of our SBS domains that we either had to script or run manually on all workstations. We are discovering that there can be quite the process to enable an application installed and hosted on the SBS 2008 box to listen for incoming connections. Not only that, the application client on the Windows Vista workstation will most likely need at least a program exception enabled in the Windows Firewall with Advanced Security properties too. After opening the Windows Firewall with Advanced Security console, right click on Windows Firewall with Advanced Security and click on Properties. Click the Customize button for Logging to enable logging on the domain profile (it should be active). Click on the Customize button for Settings and enable the Display a notification setting so that a pop-up will happen if a newly installed application tries to get out and listen. With Logging enabled, click on the Monitoring node and a there will be a Hyperlink to the logging file that can be clicked on for quick access. It will indicate any dropped packets, the port they were attempting to connect on, and whether they were UDP or TCP. Client IP is also included along with other details. PortQry V2 can be downloaded from here: PortQry V2 Download. Both commands will port a list of services listening on what ports using which IP addresses an more. If the service being troubleshooted shows up in the list as Listening, then the next step is to check that the Vista client is allowing the application client out. We put up a poll on whether to keep SnapShots or let it go: Blog Poll: Should we keep SnapShots? The responses to the poll put SnapShots out. While the feature can be handy, we try and make a point of labelling any link with a short (italicized) description of where the link will take you. The breaker for us, and one of the main reasons behind initiating the poll, was the occasional underlined word with an ad tied to it that did not fit in with our blog and its gist. The other reason was some of the ads placed around the screenshot of the page the link was leading to. There were a few other little things that grew to be irritating from a blog management point of view too. Suffice it to say, SnapShots is now gone! This post should have the ExchangeDefender footer with a link to check the e-mail's authenticity. Click through on that link to see what it has to say. For us, the ExchangeDefender footer is a sign to our clients that we take our e-mail safety seriously. And, from a business point of view, since we are an OWN partner, it is another revenue opportunity for us with our clients. Since our switch to the ExchangeDefender service for our own e-mail is now over 72 hours old, we can be reasonably confident that there are no other e-mail servers out there that are using our old DNS MX records that pointed to our three SBS sites. Since we purchased SBS 2003 R2 Premium SA for two of our sites, we will be migrating both sites to SBS 2008 and still be eligible to protect those sites with ISA. In the mean time, our sites are still behind ISA running on SBS 2003 R2 Premium. 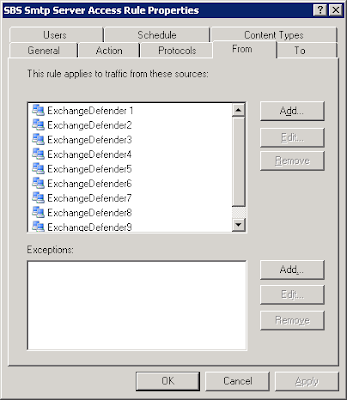 Now, the ExchangeDefender Deployment Guide addresses the need to limit the IP subnets to protect the internal Exchange server without getting into too much detail. The recommendation is to limit SMTP traffic at the firewall, but since there are so many firewall products out there, the deployment guide only shows us how to set the IP subnet restrictions into Exchange itself. For SBS 2003 R2 Premium with ISA 2004 SP3 installed, and for the time when we migrate to SBS 2008 protected by our Software Assurance benefit of ISA 2006 SP1, the setup is actually quite simple. The rule setup will be similar on the standalone ISA 2006 SP1. Once the 72 hours have passed and legitimate e-mail is flowing solely through the ExchangeDefender network, head into the ISA live Logging feature and delimit the query on the SMTP protocol. It will become readily apparent that there are a lot of illegitimate SMTP connection attempts being made. In this particular screenshot, the IP address is from Kiev (Kyyiv) in the Ukraine. We certainly hope that as time goes by that the IP address associated with our Exchange server no longer resides on spammer's e-mail server IP address list. Now that we have seen this, ExchangeDefender makes even more sense to us. We ran into one printer that had a driver that would not install no matter what we tried. Not only that, the printer would not accept the HP Universal Print Driver either. That printer was the HP LaserJet 1320. If there is a need to deploy TS Desktops or Applications and the remote users have a LaserJet 1320, then we need to install the HP LaserJet 1320 onto the LPT1: port to enable the remote users to print. When we do this, we name the printer DO NOT USE so that the remote users do not mistakenly try and run a print job to it. When configuring a Terminal Services Remote Desktop environment for users to connect to, keep in mind that SBS 2008 has the 64bit driver installed by default. When deploying Terminal Services, one needs to make sure to install the Print Services Role, and then load up both the x64 and x86 HP Universal Print Driver on the SBS 2008 box. If the user needs to take advantage of a particular printer feature on an MFP series, then make sure to verify on the HP Support site that there are no specific Windows Server 2008 x86 and x64 drivers available for that printer. As a precaution, it is a good idea to verify if there are any specific printer drivers, both x86 and x64, with HP's site and load them into the Print Management Console anyway. Fortunately, all of the fires we have been working on have been solvable, or not too critical in nature. We have done a number of SBS 2008 setups over the last little while with most of them being a non-migration of existing domains. From a really messed up Active Directory setup, a failing SBS with all kinds of hiccup issues, to a brand new set up where there was nothing to start off with, we have seen a lot of good things with SBS 2008. The migration side of things we are saving for our own domain first. We will virtualize our current SBS 2003 R2 Premium and proceed to chop it up into little bits over and over again (hopefully only a couple of times). For now, with the timing crunch here, suffice it to say that SBS 2008 really does improve things from both a user and admin perspective. It is well worth the step up from SBS 2003. Here are some excellent instructions for enabling the SharePoint spiders to crawl and index PDF files and their text content: SharePoint Server 2007 and SharePoint Services V3 PDF search and indexing. Download the above iFilter v9 from Adobe's site. Extract the installer from PDFiFilter64installer.zip. Click Start and right click on Command Prompt and Run as administrator. Click Continue at the UAC prompt. In Windows Explorer, double click on the PDFFilter64installer file. In the C:\Program Files\Common Files\Microsoft Shared\Web server extensions\12\Template\Xml\ directory edit the DOCICON.XML file. There will be a need to save the modified XML file to the server's desktop and then copy it back into the XML folder through two UAC prompts. Click Start and type Windows SBS Native Tools Management [Enter] in Search. Click on the IIS Manager. Under the SS-SBS (MySBSDomain) click on Application Pools. Or, instead of recycling the services, append the System Path with: C:\Program Files\Adobe\Adobe PDF iFilter 9 for 64-bit platforms\bin\ and reboot! The update to the System path is suggested in the Adobe installation instructions. One very, very important thing to remember: Upload the PDF files AFTER the Adobe PDF iFilter is installed so that the files are indexed. Otherwise, they will not be indexed until they are touched! This is very important if there are thousands of PDF files to place into a document library or libraries. UPDATE: Added the System Path variable to be appended in the last step, and made some grammar error corrections. OWN provides us with a simple VBS utility to run on the Exchange server to extract all e-mail addresses on the Exchange server. This dump file is then used to set up the e-mail addresses in ExchangeDefender. Given the fact that the download resides on the OWN blog, the script will need to be downloaded to the Technician's Thumb Drive ahead of time if working with the server in person with no workstation access. Otherwise, have a zipped copy of the utility on the shop's Companyweb site or via a link to the ExchangeDefender download if working from a workstation. Click Continue on the UAC. We upload the resulting text file onto our own SBS Companyweb site as we run the ExchangeDefender Admin portal from within our shop network. That keeps things simple and the resulting SMTP Dump file becomes a part of our SBS setup documentation. We previously mentioned the situation here: SBS 2008 - RWW and OWA Idle-Time Caveat or Hiccup? Essentially, if you pass through the Remote Web Workplace into Outlook Web Access and leave the RWW window/tab open but idle, it will time-out after 30 minutes. The problem is, the active OWA window/tab will hit an OWA logon page once the RWW has timed out too. Even though OWA was being used right up to the moment RWW timed out. A bug has been filed on the Connect site: OWA Time-Out Behaviour when Remote Web Workplace idle time-out is reached. If this issue is important to you, please take a moment to rate the bug. It has already been validated by the SBS Team. To deploy printers to 32bit XP clients via Group Policy in a 64bit SBS 2008 network can be frustrating if we are not aware that the utility included with SBS can only work with 64bit versions of XP Pro. Our previous blog post on the matter: x86 PushPrinterConnections.exe a must for the Technician's Thumb Drive! Hopefully we can have the 32bit utility included in R2. Now that SBS 2008 has been out for a while, we have begun to see the realities involved with the migration process. Primarily we are talking about SBS 2003 to SBS 2008. Both internally, and via the Internet it is not hard to find migrations that have hiccuped leaving the source or destination server useless, or in some cases where both are toast. 1: Make a ShadowProtect image of the source SBS 2003 and do an HIR based restore with that image in our shop. This tests for a fall back if things don't work. 2: Run the migration process against the newly HIR restored SBS in our shop looking for gotchas and the death of either SBS. We then know what we are getting into. 3: Run a ShadowProtect incremental just prior to initiating the actual migration process as well as during. Our fall back is ready and up to date. In the end, the extra time and precautions will give us the confidence we need to come through any migration successfully.